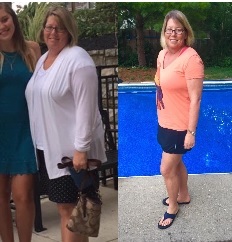 January Member Spotlight: Jill D.
After 20+ years of struggling with my weight and yo-yo dieting, I was at my highest weight ever and I was willing to try anything. I was pre-diabetic, had high blood pressure, metabolism syndrome, insulin resistance and had Polycystic Ovarian Syndrome. I was desperate and knew I had to do something different. I knew I had to change my diet and I had to ramp up my exercise routine. Instead of eating 1000 calories a day (lean cuisine and weight watchers meals), like I had been doing, I cut out sugar and started eating low carb. The first two months I lost some weight, but I wanted to jumpstart and shock my body to really ramp up the weight loss so I started CrossFit at CrossFit Continuity, next door to Miami Athletic Club and took my 1st class in October 2016. I was intimidated. I was embarrassed, I couldn’t do a lunge without getting up unassisted. I was really afraid to try CrossFit, but my Doctor kept telling me I needed to workout with weight as that is what would allow me to boost my non-existent metabolism. After learning CrossFit in the intro On-Board program, I attended regular CrossFit class. I was in horrible physical shape. I couldn’t run 50 meters let alone 200 meters, I couldn’t do a push up or a squat. I was dead last in finishing the first work out and was a whole set behind everyone else. That’s when something incredible happened! The whole class came outside to run the last 200 meters and complete the last round of 10 burpees with me and then they cheered for me when I finished. It was then, I knew I had to continue. It was their encouragement that kept me coming back. The members supported me, made it fun and enjoyable, they encouraged me and it was inspiring. I can’t believe how much I can do now! I like that each workout is scalable. If I can’t do a pull up, there is something else I can do. I choose my weight. I absolutely love that each workout is diverse, fast paced and not boring. Each month, the weight kept falling off. After 100+ pounds lost in 1 year, I can’t say enough about CrossFit and the changes is has made in my life. I went from a XXXL size 22 to a M and size 10-12 in 1 year. I am no longer pre-diabetic, I don’t count calories and my metabolism actually burns now. I was tired of being unhappy and unhealthy. If you are ready to have fun, try something new and make a lot of new friends, then CrossFit Continuity is for you. Come workout with us. It’s so fun!